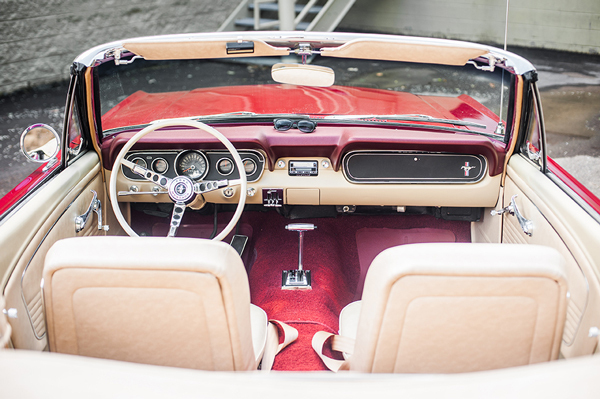 Planning your trip with a vintage classic car or want to make your wedding stand out? Come read our blogs and articles to learn about vintage classic cars and how to fully experience what a classic car can offer to make your event or day 100 times better. Following our post about why you should rent your classic car, this article will give you a step-by-step guide to list your car. N.B: Vinty can do this setup for you if you prefer, simply contact us. Step 1 - Sign up for Vinty The first step to being able to list your classic car: you need to sign up! You will receive a confirmation email right away and you can now log into your Vinty account. 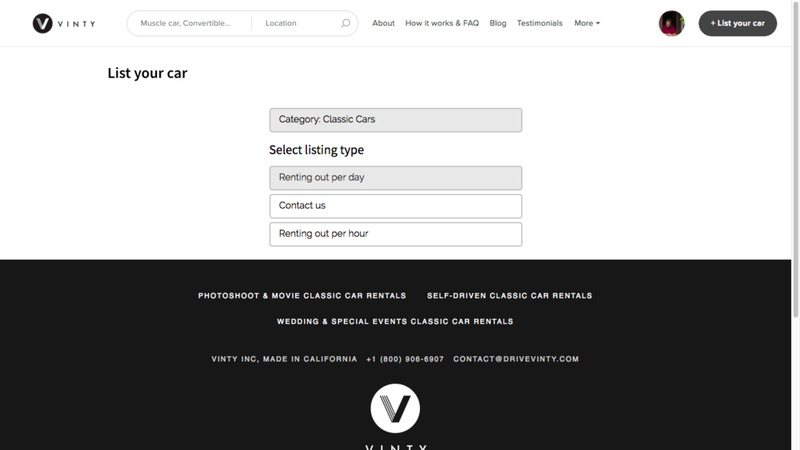 Step 2 - List your car Now that you have a Vinty account, click the button on the top right "List your car". 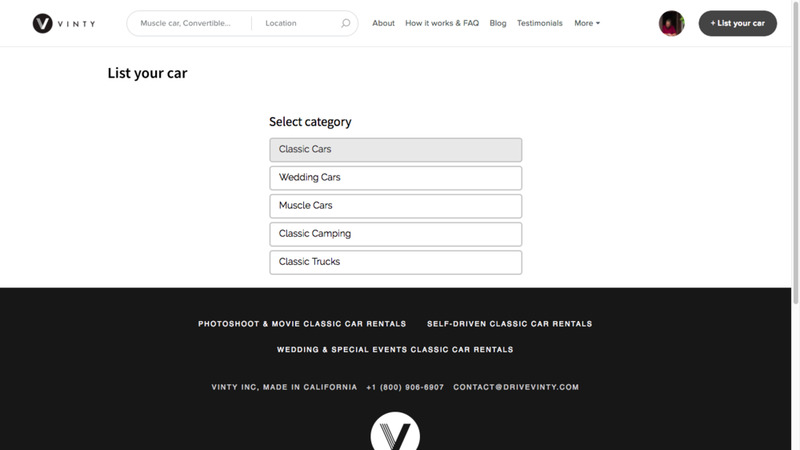 Now, you need to select a category: What kind of vintage car do you want to rent out? Select a listing type: you can rent your classic car per day, per hour, or select the "contact us" option if you would rather discuss pricing case by case. For the first two options, you will need to set a price for your car. Please keep in mind that Vinty takes a 20% commission on rentals and Paypal's transaction fee is about 3%. On this next screen, you will be able to set up all the specifics. We recommend being exhaustive about your rental conditions (rental type, locations you are willing to cover, etc.) in the description and uploading great pictures (exterior and interior) to make your listing as attractive as possible. Once you are done, hit the "Save listing" button. The next screen will allow you to edit your availability calendar (optional). You can get back to it later if you need. Step 3 - Setup payout information In order to accept reservations, you need to enter your Bank Account or Paypal account information. You will find this option in your account. Go to "Settings" and then "Payments". There are two ways to receive payments on Vinty. 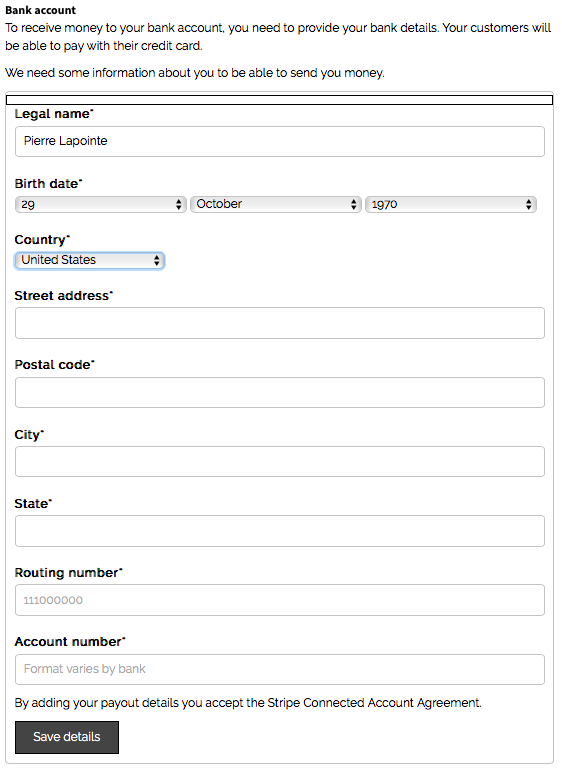 Either by entering your Bank Account information or by connecting your Paypal Account. To receive money to your bank account, you need to provide your bank details. To accept payments using Paypal. 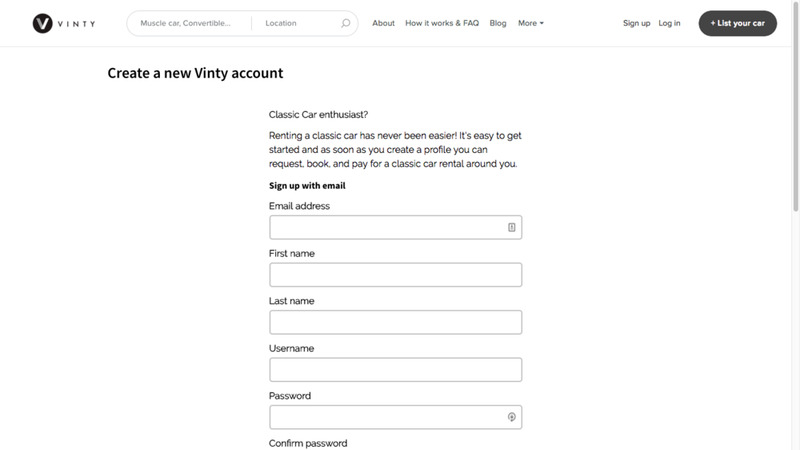 "Connect your Paypal account" - this will grant permission for Vinty and Paypal to connect each other and accept payments for your classic car rentals. "Grant permission to charge a transaction fee" - After you make a sale on Vinty, a service fee (20 % of the total price) will be charged from your PayPal account. Permission to do this is required in order to accept payments in Vinty. Hooray, everything is set up! You can start making money renting out your classic car! Step 4 - Your listing is online Congratulations! Enthusiasts will be able to find your beautiful classic car on our site and rent it for photo shoots or chauffeured events. Questions? Issues? Please refer to our FAQ or send us an email! Last week, Vinty assisted the Black Lemon event agency in organizing a multi-location photo-shoot for famed French luxury fashion house, Yves Saint Laurent. Black Lemon contacted us with their idea and asked if we could help. They needed cars and drivers that looked the part. We were able to do more - we coordinated with each venue to ensure parking and setting for the shoot, and identified the best routes to each location and helped to ensure that the event ran smoothly. All in all, it was a lot of fun but also hard work to make sure everything goes according to plan! We knew starting this business that we would raise interest from brands and companies wanting to promote their product with classic cars, so it was an exciting achievement to work on this project. We gathered our crew of drivers and cars in Marina Del Rey at 7:30 AM and convoyed to Downtown LA (aka DTLA). The plan was to pick up our guests - photographers and team from Yves Saint Laurent, along with their models - social influencers who had flown in from all around the world - from the Ace Hotel at 8:30 AM, after which we were going to several locations in DTLA for the shoot. Our drivers were fired up. Riding in these classics is always very exciting, and ten of them cruising the streets together makes for quite a scene! From the thrill of the V8 engines of the Impala and the Mustangs to the feeling of cruising in the Cadillac Eldorado and DeVille. After picking them up, we split into two groups - one group was driven to the Art Share L.A gallery. In the meantime, the other group of guests proceeded to the Order DTLA Tattoo Parlour, where they got tattooed and hung out in the artists' studio. Lunch was held at The Row, and we then switched the groups in the afternoon. The activities finished around 4:30 PM. With the rain starting early in LA, the driver of the one car missing wipers had to improvise a bit but hey, this what happens with 50+ years old vehicles in "sunny" California! Overall, the day felt like a dream. Our guests were thrilled to be able to take great pictures and experience Downtown LA in legendary vintage cars. People passing by approached us to share their own stories about the cars. Being able to bring wonderful memories to each and everyone that encountered our classic autos was the cherry on the cake. We look forward to helping with other corporate events soon, don't hesitate to contact us if you need to rent classic cars! The Ford Mustang defines what a classic car is for many enthusiasts. It can be a serene boulevard cruiser or a ground shaking muscle car. And the passion for keeping the Mustang charm alive has initiated a rebirth of classic Mustang styling in recent model years. Just compare the 1965 fastback to today’s sixth-generation Mustang. The similarities are obvious. It seems any car with a strong cult following has a unique story worth telling. And the Ford Mustang is no exception. The Mustang began as concepts, namely the 1962 Ford Mustang I and 1963 Ford Mustang II. The Mustang I was the most interesting of the two. It was an open cockpit two-seater with, believe it or not, a mid-mounted 4-cylinder engine. The Mustang I concept bared little resemblance to the final production car, but it was it was a fascinating design study from an American car company. Ultimately, the two concepts were used to test the public’s acceptance of a new Ford coupe. The production car was introduced to the public in April of 1964 at the New York World’s Fair. Interestingly enough, the Ford factory was already making the car, as the automaker’s assembly line had ramped up the previous month. Sales of the Mustang actually began five months prior to the normal start of the 1965 production year. Thus, among Mustang aficionados, the first cars are commonly referred to as 1964½ models. But to Ford, the Mustang was advertised, VIN coded and titled as 1965 models. The Mustang hit the ground running, opening to rave reviews around the country, which included 2,600 publicity articles in newspapers. A convertible even appeared in the James Bond film, “Goldfinger,” in September of 1964. The initial plan for the Mustang was for it to be strictly a two-seater. But after realizing how well the Thunderbird did following its change to a 2+2, the Mustang design changed as well to include front bucket seats and a rear bench seat. The additional Fastback model was introduced in August of 1965. 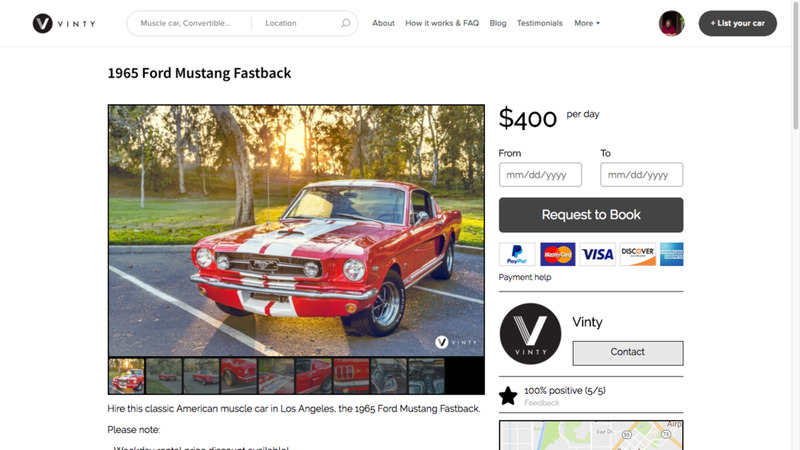 As one of the most requested cars on Vinty, the mystique of the Ford Mustang is just as strong as ever. There are several to choose from including this beautiful 1965 Fastback to the car pictured above, a 1966 convertible.